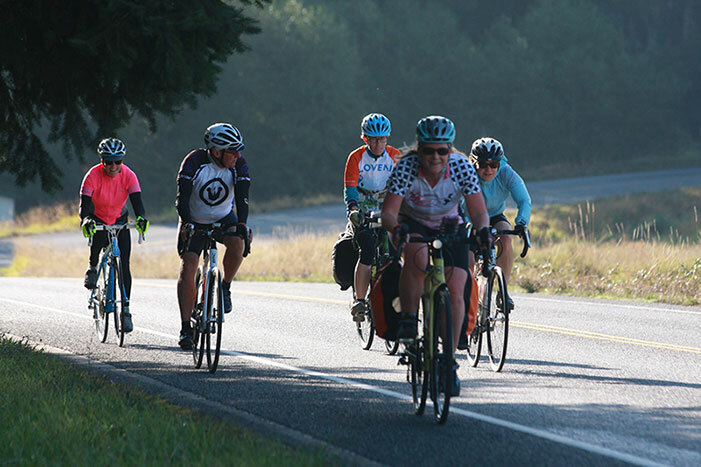 The upcoming Friday Harbor Bike Fest is the third annual bike ride sponsored by the San Juan Lions Club. In the past this event was known as the Friday Harbor Bike-n-Brew. This year’s event is being held on June 1st to coincide with the 30th annual San Juan Island Artists’ Studio Tour. There will be numerous ride options, a 12-mile ride, a 20-mile ride, and a metric century. Other choices include the option to take in the San Juan Island Artists’ Studio Tour (approximately 37 miles) by biking from studio to studio or just choosing your own course on our beautiful island backroads. The fee for the rides has been simplified; $50.00 for a single rider, $80.00 for a couple, and $100.00 for families (immediate). This year’s event is being held at San Juan Island Brewing in downtown Friday Harbor. Breakfast (no host) will be available starting at 8:00 am from the local Cutthroat Pirates. The supported rides will be from 10:00 am to 4:00 pm but you can start and finish any time you wish. There will be SAG stops in a couple of key locations along the routes staffed by Lions members and friends of biking. The above fee includes a Tri Tip BBQ meal, featuring local BBQ aficionado Billy Grewohd (vegan burgers will also be available), at the end of the ride. For your enjoyment there will also be 4 hours of live music provided by local musicians starting at 3:00 pm. Enjoy a pint of Ale or Lager from the locally crafted San Juan Island Brewing Co. or sip a glass of wine from award winning estate-grown San Juan Vineyards at an additional cost. This event is a fundraiser of the local Lions club. Net proceeds support local needs in our community including, but not limited to, college scholarships for local students, vision and hearing needs and etc. Come and enjoy San Juan Island with its fantastic views of the Salish Sea, surrounding majestic mountains, lush farmland scenes and perhaps catch a glimpse of a fox or two or maybe even experience a whale sighting. For more details please see our web site, www.FridayHarborBikeFest.org .